Turkey Trots have a long, rich history and these days they're practically as much of a Thanksgiving tradition as the bird itself. 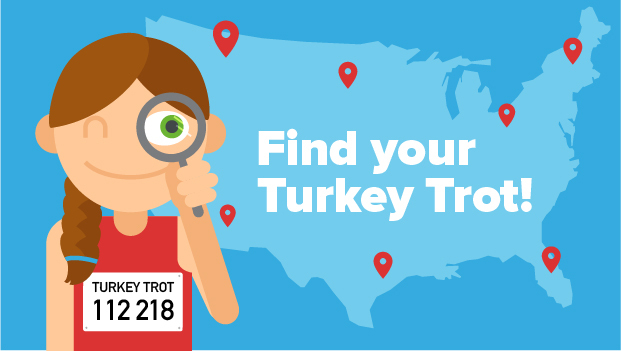 Find the best race near you so the whole family can earn that extra slice of pie. What Makes It Special: In its 16th year, this rolling course winds through the beautiful Anthem community in the shadow of Daisy Mountain and Gavilan Peak. What Makes It Special: While most Thanksgiving races are held on the actual day, the Fat Turkey Trail Run takes a different approach. Held the Saturday after the big day (when you're feeling like a Fat Turkey yourself), you can toe the line for 5K or 10K on the trails of Papago Park. Plus, if you beat the turkey to the finish line, you'll receive a custom Fat Turkey pint glass—who needs more motivation than that? What Makes It Special: A rarity among Turkey Trots, this race has a mix of dirt and paved trails. It also features wonderful lake and mountain views. What Makes It Special: This is the only Thanksgiving race set in historic downtown Los Angeles. And all participants will receive a sparkly finisher medal and comfy race T-shirt. What Makes It Special: Thanksgiving is all about giving thanks for everything you have in your life. To many, it's also about giving back. Run for the Hungry, established in 2002, allows you to do both. Start off your Thanksgiving with a 5K or 10K walk or run that benefits people who face hunger in the San Diego community. All profits raised are donated to the Jacobs &amp; Cushman San Diego Food Bank and other hunger-relief programs in the area. What Makes It Special: San Francisco's 16th annual Turkey Trot isn't your ordinary race. Priced by the calorie, the race offers three options for your pre-Turkey feast: the Turkey Trail Trot (5-mile run, 600 calories), Pilgrim Promenade (3-mile walk, 300 calories) and Kids Gobbler Chase (100-meter fun run, 8 calories). Proceeds from the race will also benefit Lowell High School's track &amp; field team. What Makes It Special: With multiple distance options, this race is a fun way for the whole family to start their Turkey Day. Challenge yourself to the 10K or walk 5K with your kids. Plus, your race entry will help support the Burbank Community YMCA's financial assistance program, which enables the Y to avoid turning away anyone from membership due to inability to pay. What Makes It Special: Open to walkers and runners alike, this race offers three different distances: 5K, 10K and a rare Turkey Trot 15K. The views are also unmatched, just in case you needed some additional arm-twisting. What Makes It Special: Most Turkey Trots are usually 5Ks—but not the Longmont. This 10K race is go long or go home, and after more than 40 years, this race isn't slowing down anytime soon. Added bonus: All proceeds benefit the City of Longmont Youth Scholarship Fund. What Makes It Special: Started in 2013 as a fundraiser to help cover a friend's medical costs from cancer, the race has been held every year since, raising money for various organizations, such as the Gooding Volunteer Group's playground fund and the Gooding Fire Department. The Gooding Cross Country Team will receive proceeds in 2018. What Makes It Special: Get some exercise and give back to the community at the 20th annual Scheels Turkey Trot. Choose between the 10K or the 2-mile untimed walk or run around Sparks Marina. What Makes It Special: Get some exercise in before all the parades, football and food by taking on this race that's fun for the whole family. A portion of the proceeds benefit RunFit, an after school running program for kids, as well as the RunFit Mobile Food Pantries. What Makes It Special: Family, friends and a fast and flat course on a paved route. Plus, it doubles as a fundraiser for the Taos Swim Club's Children's Swimming Program. What Makes It Special: Distances of 1K, 5K and 10K make this race accessible for the entire family. The course runs through beautiful Bountiful, Utah, and the name is fitting because you'll be making room for all those bountiful calories...er, blessings. What Makes It Special: The idyllic setting on Bainbridge Island in the beautiful Puget Sound off Washington's coast is almost reason enough to make this Turkey Trot special. It's worth the ferry ride over from Seattle if only to take in the island's quaint community. Proceeds from the race benefit the Helpline House. What Makes It Special: This race takes place two days after Thanksgiving—just enough time to let you really consider whether you need to do those three miles after all. When the answer is inevitably yes, this Leftover Turkey Trot race will be there to burn off those calories. The race benefits two local nonprofits: Camp Prime Time and Yakima Greenway.